"these are not ordinary times"? We are absolutely serious about the declaration that these are not ordinary times. By countless indicators, describing multiple aspects of the human and global condition, we are in the midst of a situation which has no precedent in human history. This new situation has powerful implications -- practically, spiritually and morally. Here are some of the factors that put us in a qualitatively different situation than humanity had ever previously known. There are now over 7 billion humans on the planet. The rate of growth through the last two centuries has been exponential. The world's population first surpassed 1 billion people in the early 1800s, and hit 2 billion people around 1930. In less than 30 years, the world population topped 3 billion (1959). It more than doubled from that -- with an additional 4 billion -- in less than 50 years. So many more people on the planet causes change in itself. Those changes are amplified when rising affluence means that each person, on average, has a larger environmental footprint. New technologies have allowed human activities to have much larger impacts on Earth. Ocean fishing practices with longlines, trawlers and factory ships have facilitated the depletion of ocean fisheries. The ability to mine coal from deep beds, then to extract vast quantities of oil and gas, have powered an expansion of human activities that was impossible when life drew only on current energy. Rapid and easy transportation around the planet, for people and for goods, is one cause of species extinction. Advances in medicine and public health are primary factors in population growth. Revolutions in communication have completely changed the way that people interact with local and global communities, and are shifting the way we define knowledge and wisdom. 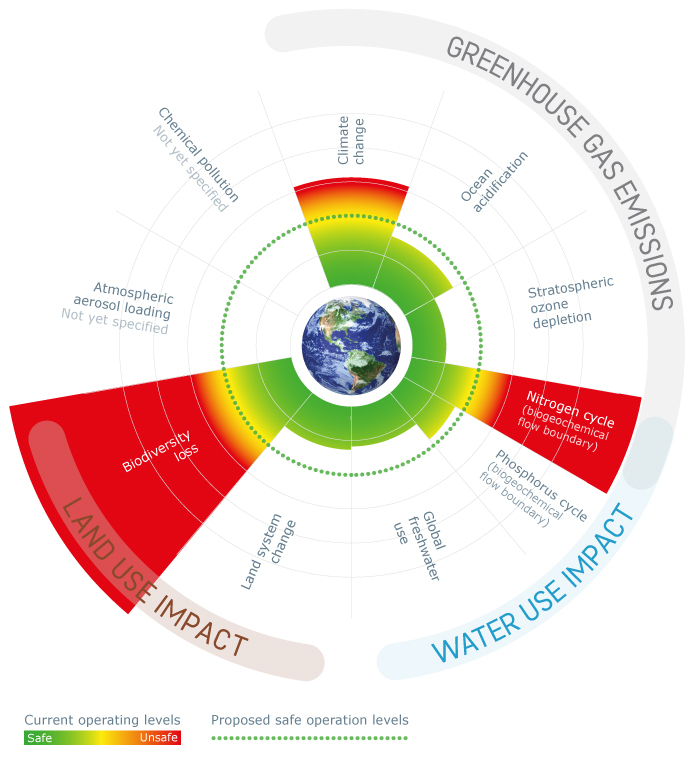 Within just the last 50-100 years -- driven by the combination of greater numbers and powerful technology -- human impacts have pushed past three planetary boundaries, with other global systems in danger zones. The best known and most discussed of these three is global climate change. Even greater threats to Earth systems are the loss of biodiversity, with species extinction occurring at a rate and scope not seen since the demise of the dinosaurs, and the nitrogen overload in soil and water from the over-application of fertilizers. For the first time, a majority of humans now live in cities, where they are increasingly separated from the natural world. There are countless people who never see the stars, which used to be a universal experience of awe and humility. There are many adults who do not know where their food comes from, even to the point of not knowing that it is derived from plants and animals. (Milk comes from the grocery store!) Psychologists speak of a "nature deficit disorder" in children who never have an opportunity to play outdoors. The dominant global economic system, reinforced by governments and corporations, is anti-sustainable. It is built on principles that demand perpetual growth and consumption. Economies and marketplaces now function to sustain growth, not to meet actual human needs. People -- now commonly known as "consumers" -- are manipulated and enticed to propagate the flow of goods and services. None of these factors were known, or even imaginable, 500 years ago. All of them have taken on new forms and powerful manifestations within recent decades. Scientists are discussing whether Earth is entering a new geological era, the "anthropocene," where human activities are a dominant force on all planetary systems. What is going on may appear "ordinary" if we take a short-term look at the world, but they are not consistent with long-term human experience, or the natural functioning of Earth systems.